There are so many mini events and activities that are part of a whole wedding celebration, and a few of them may be worthy of an invitation all on its own. Perhaps the most important non-ceremony or non-reception event of a whole wedding celebration is the rehearsal dinner, when the bridal party and family members gather in a more intimate setting. 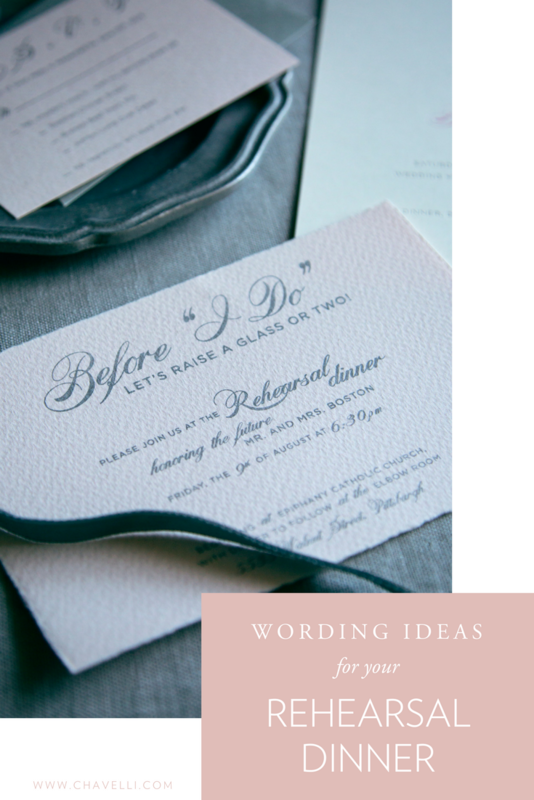 Ultimately, rehearsal dinner invitations can be handwritten, telephoned, or even emailed. However, a tangible invite might be more helpful for out-of-town guests, and they certainly bring a sense of importance and formality to the event. If you’re planning on having the actual wedding rehearsal right before the dinner, list the time and place of the rehearsal and the time and place of the dinner on the invitation, so that everyone is aware of the schedule for the evening. Most people send out their rehearsal dinner invitations as part of the full wedding invitation suite. However, if you aren't able to do this—say, you don't have all the details just yet—just make sure you don't forget to send them out with adequate time to get your rsvps! So what how might you word a rehearsal dinner invitation you ask? Well aside from the date, time and venue location, here are some wording ideas to get you started! Love, Laughter, before Happily Ever After. Please join us for a wedding rehearsal celebration honoring [insert couple's names here]"
"In anticipation of [name] and [name]’s big day, we wouldn’t celebrate any other way than in the company of your family and friends." "A romantic affair… something special is in the air. Kindly join us as we celebrate on the eve of the marriage celebration uniting [name] and [name]." "Please join [name] and [name] as they toast to their families at their wedding eve dinner." "Before ‘I do’, let's raise a glass or two!"